Late-night TV host Conan O’Brien brought national attention to BYUtv sketch comedy Studio C when his children became super-fans. Conan praised the quality of the sketches on the show, saying that the cleanliness of the humor was almost an afterthought. But it is the conspicuous absence of questionable content that became the focus of a recent article in the Wall Street Journal which nonetheless praised the show and highlighted its growing popularity. The article is written by Bradley Olson and excerpted below. Studio C has achieved sizable popularity on the internet, despite—or perhaps because of—its super-scrubbed brand of clean humor, such as a skit about a soccer goalie named Scott Sterling who accidentally, and agonizingly, blocks shots with his face. Working blue is out of the question for this comedy troupe. BYU, run by the Church of Jesus Christ of Latter-day Saints, has ranked as the nation’s most “Stone Cold Sober” place of higher learning for 20 straight years, according to the Princeton Review. The performers are employees of the Provo, Utah, school and must adhere to its honor code, which includes following church principles such as eschewing smoking and avoiding coffee. Male cast members must obtain university permission to grow facial hair—dubbed a “beard card” by students. Writers at Studio C, which launched in 2012 and began its new season this month, must avoid innuendo, cursing, politics—even the word “gosh,” because it sounds too much like “God.” Flatulence jokes don’t stand a prayer of getting past the BYU television censors. But bits like the appearance of curmudgeonly Harry Potter character Severus Snape on a “Bachelorette”-like reality show—that works. 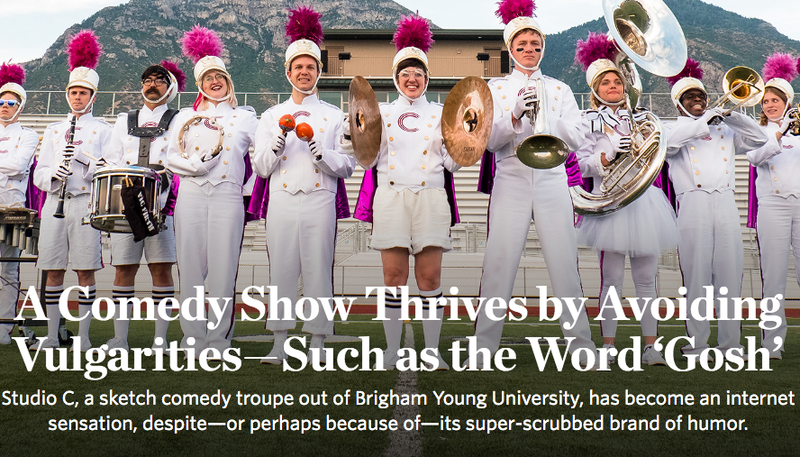 The result: a burgeoning pop-culture phenomenon that has racked up more than 1 billion views on YouTube—about a third of the number of “Saturday Night Live.” Studio C’s success, flying in the face of comedy’s subversive ethos, is an irony not lost on university officials. To read the full article on the Wall Street Journal, click here.